Department of Defence and Strategic Studies | Visit by the Team of National War College, National Defence University, Washington DC. Visit by the Team of National War College, National Defence University, Washington DC. A delegation comprising of students and faculty of the U.S. National War College in Washington, D.C., visited the DSS Department on Monday 17th May, 2010, for a Roundtable discussion on Pakistan US Strategic Issues. 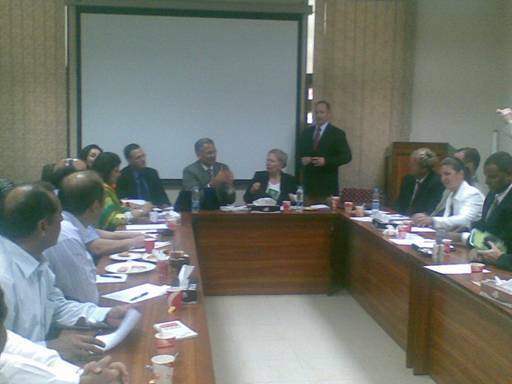 The visit was part of the NWC’s Foreign Area Studies tour to Pakistan, during which they received briefings from Pakistan Military and US officials, as well as participated in several interactions with Pakistani officials and academics. A unique honor, as this was the first time, NWC-NDU team chose to visit a Pakistani academic institution for interaction and exchange purpose. The team comprised of the Dean of Faculty, NWC, Col Michael Bell, Dr. Cynthia Watson, Faculty NWC and students largely comprising of mid ranking military officers. The DSS department was represented by its chair, Dr. Rifaat Hussain, faculty members, PhD & MPhil students. The roundtable discussion centered on critical issues affecting Pakistan US relations and the strategic environment. Issues such as the Afghan war, global war on terror and its direct as well as indirect effects on Pak-US-Afghan triangular relations, the rising anti-US sentiment post 9/11 and change of perceptions were mainly discussed. Both sides very candidly exchanged views and talked about problems rising through US episodic strategic interests in Pakistan, courting of unpopular regimes, which proved extremely harmful for long term relations and political stability of the state. Proliferation and nuclear safety concerns, Pakistan China relations, Iran, Afghanistan and India as important actors for both Pakistan and US in the region were discussed at length.